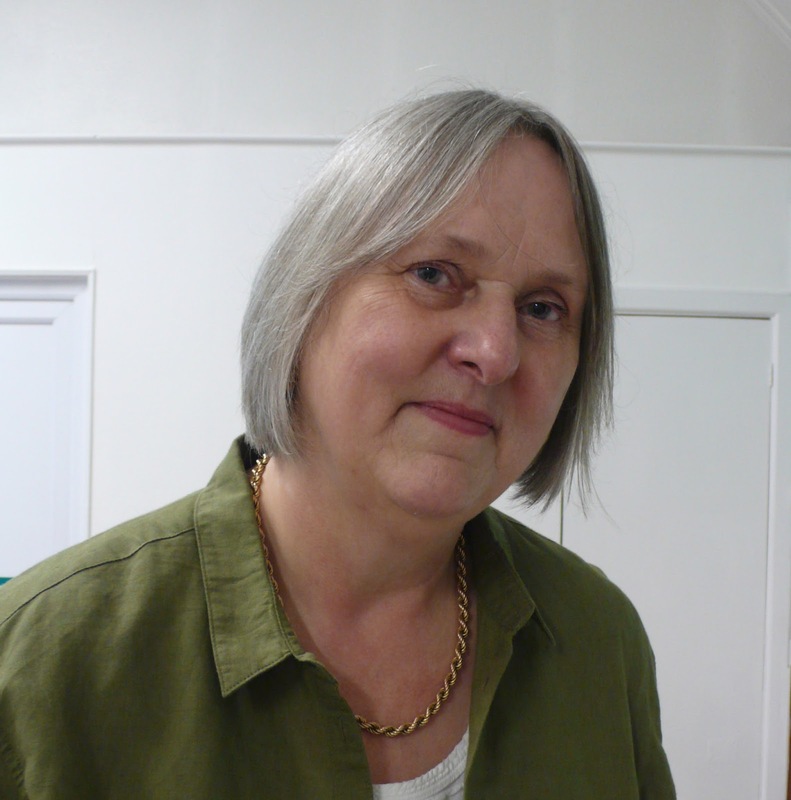 We met up on Monday 15 May 2017 for a fascinating evening with Pamela Smith. 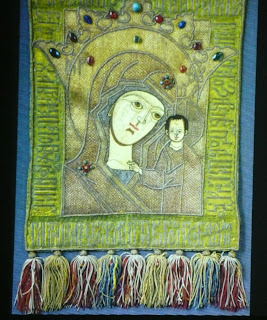 Pamela introduced us to Russian metal thread embroidery and explained how it has developed over the centuries. 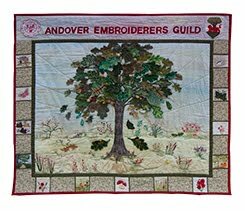 The earliest examples are of ecclesiastical embroidery, such as altar fronts and vestments, worked with couching and split stitch. Russian aristocrats set their peasants to work to produce their sumptuous embroidered garments. The Strogonov family, who were wealthy merchants and later ennobled, set up embroidery workshops and employed peasants as well as family members to produce beautiful embroideries. Some items, such as elaborate headwear were also made in monasteries. The picture below shows the front and back of a dushegreya or 'soul warmer'. 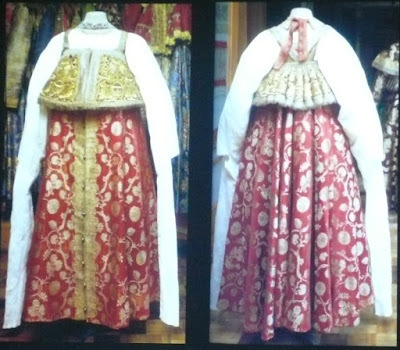 The bodice is heavily embroidered with goldwork and the sleeves are exceptionally long to display a 'waste of fabric', indicating that the wearer was wealthy. 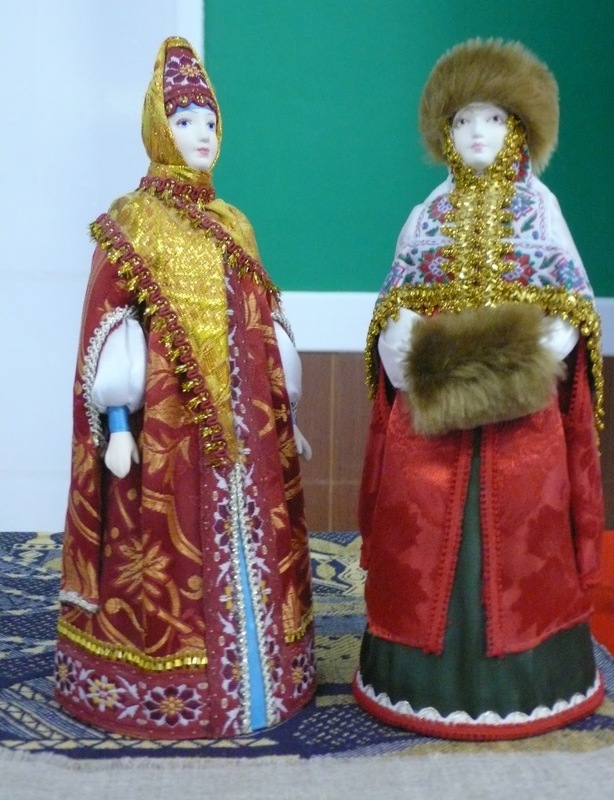 The secret of staying warm in Russia was to wear multiple layers, as these dolls demonstrate. However after Peter the Great saw what was worn at court in the west, he insisted that his courtiers adopt this style, so bodices became lower, coats shorter and everyone at court suffered from the cold! 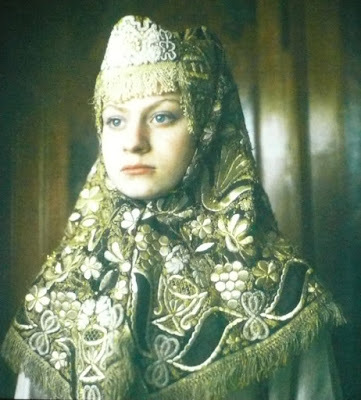 Pamela also spoke about the ancient city of Torzhok, founded in the 11th century by Novgorod merchants as a goldwork centre and it remains the centre for goldwork embroidery in Russia today. Many thanks Pamela for a very interesting talk, not only did you provide us with an insight into metal thread embroidery but also gave us a taste of Russian history and culture.